I visited many temples from Buddhist to Hindus and this one is uniquely beautiful out of all. The most unconventional Buddhist temple I ever been to. 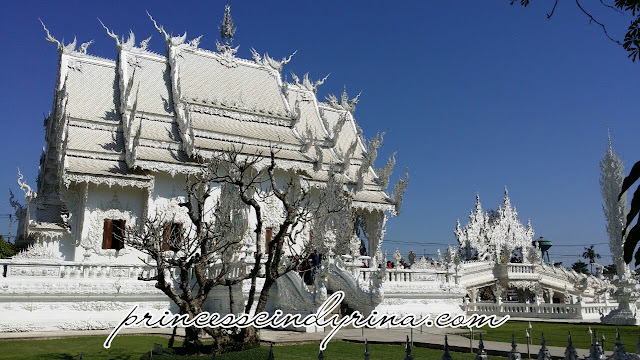 Wat Rong Khun or more well known as White Temple is in Chiang Rai, Thailand. This is not a ruined or even historical place. This place built in year 1997 by noted Thai painter who turned architect and still in progress. To me the building it self from far look so majestic and enchanted. The main building is painted white as its symbolize Buddha's purity. Most astonished that this place is covered in mosaics of mirrors which give amazing sparkling effect under the sun. I bet it look awesome beautiful at night too but it may be scary at night. You know what I mean if you read further. The hanging head. This is what I mean...gosh! this White Temple is full of bizarre and horror creatures face. Just imagine walking at night and stumble onto that head....Ommaaaaa!!!! To reach the temple you have to walk over a bridge over the moat filled with innumerable sculptures of out reaching arms. Another horror reaching out effect here. Look like hell imagination to me. Apparently , those reaching out hands symbolizing DESIRE. Once inside , amazingly I was greeted but non traditional Buddha life scenarios. I wish I could snap photo but no photo allow in the temple. The inside mural full of contemporary scenes and icons. More like good and evil fighting kind of scenes. The artist still put in a Buddhist context though. Do you believe me if I said they even painted Batman, Superman and even Minion in that temple. Not to mentioned they have a spaceships painted on the wall too. I was like...WTH! However, amidst of all those chaos fighting the evils and those destructions they have golden flowers surrounding sits a peaceful white Buddha in front of an even larger Buddha. Wat Rong Khu is still a work in progress and will be more interesting in future. This place also known as a learning and meditation center for people to practice dharma. So surrounding the main white temple is planned for more buildings like preaching hall, museum, pavillion and others. This place is pretty big like around 3 acres if I'm not mistaken! Wanna wish upon the Buddha? 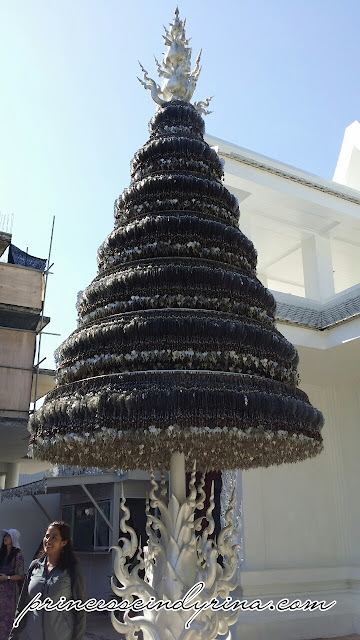 Pay 30 THB to write your wish on that metal things and then hang it on this bell looking place. I wanted to pee and decided to walk to the toilet way at the back. 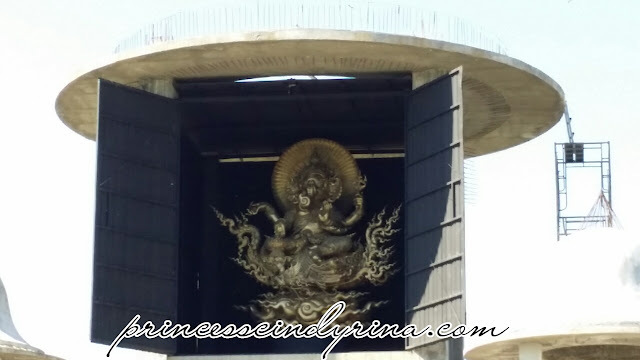 On the way to toilet saw Lord Ganesh statue. In front of toilet ...Ommmaaaaa!!!! they have this horror looking guardian right in front. WTH! Gosh! I wish there is more human here in the toilet that creepy creatures as guardian. Seriously , my quickest peeing ever! 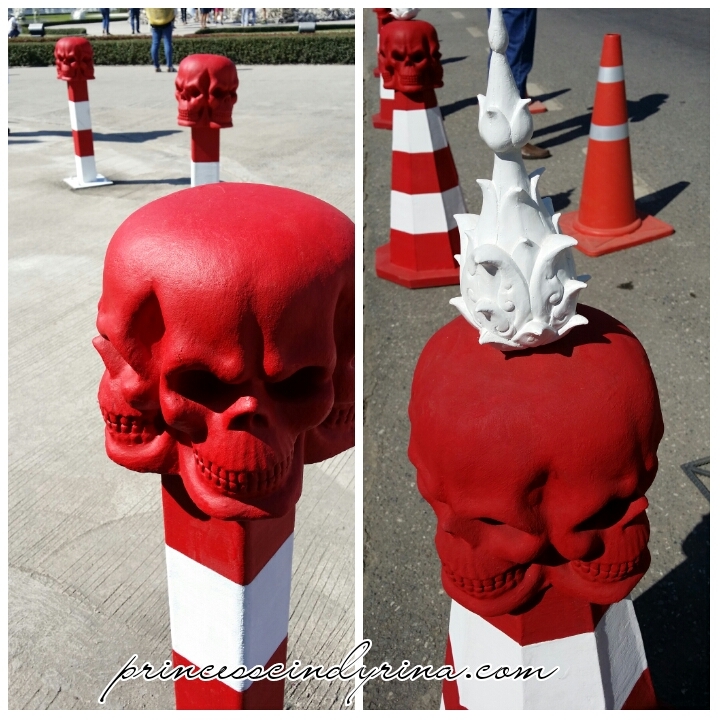 The street barrier and cones is with skull head. huhuhuhuh... this artist is full of creepy imagination. If I am driving and my car stuck near Wat Rong Khun...I will be in mental breakdown state due too scared. 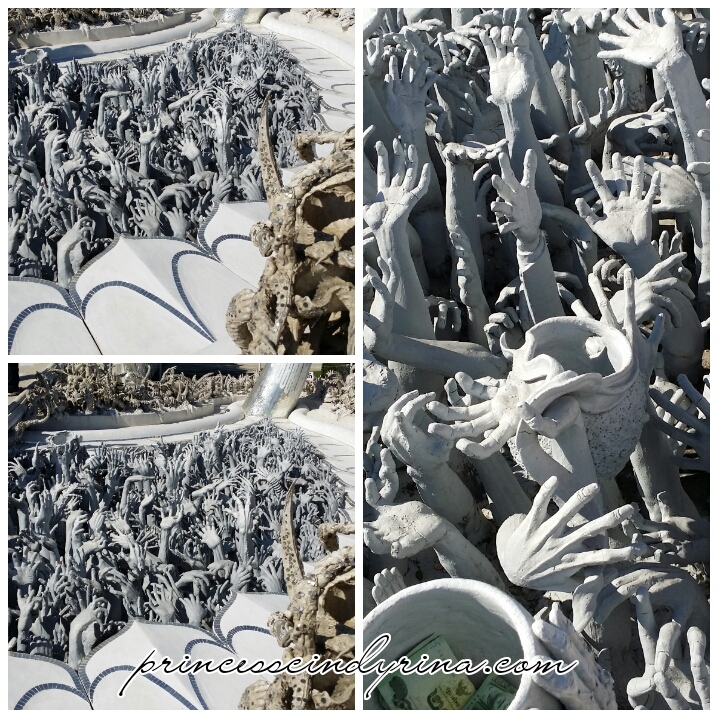 So scary with so many hands like asking for help. Ha ha ha... Great historical place. 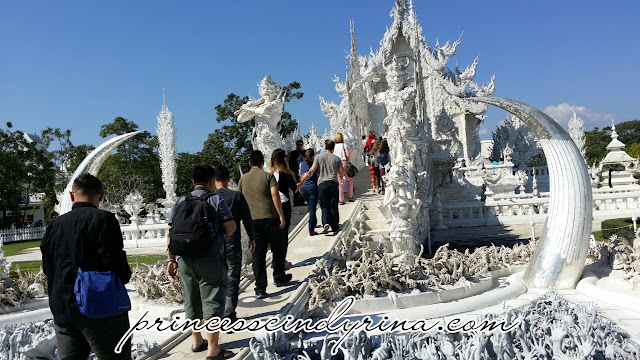 The white temple is very famous, hope to visit it in future. Interesting temple! Last time my visit there it was still under constructions. such a special temple! hope i can set foot there one day!! 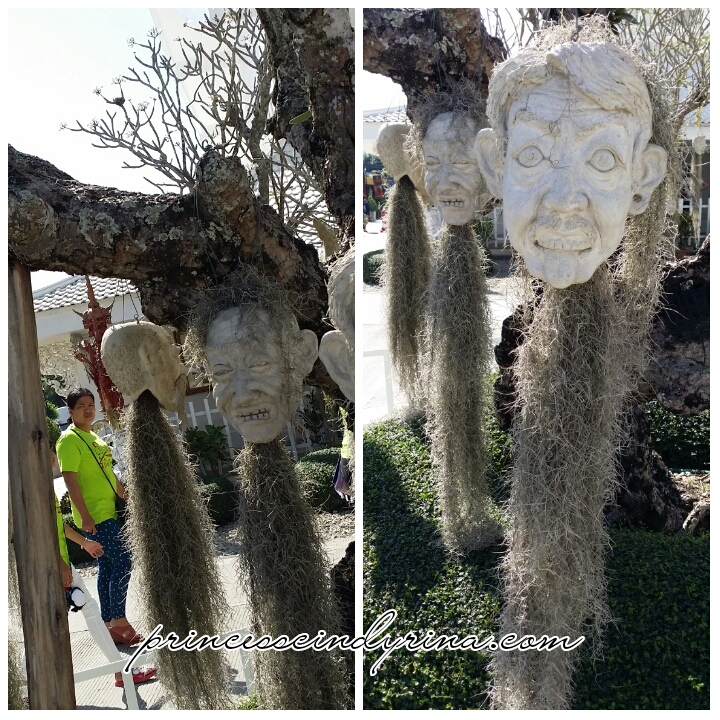 They look scary but I have admit that the statues are so delicate. Such an awesome building.. Really unique look! Hahahha your writing always make me laugh! The architecture is really quite intricate. Don't like the monsters and the hands! This is quite scary for me :( but i want to visit it! 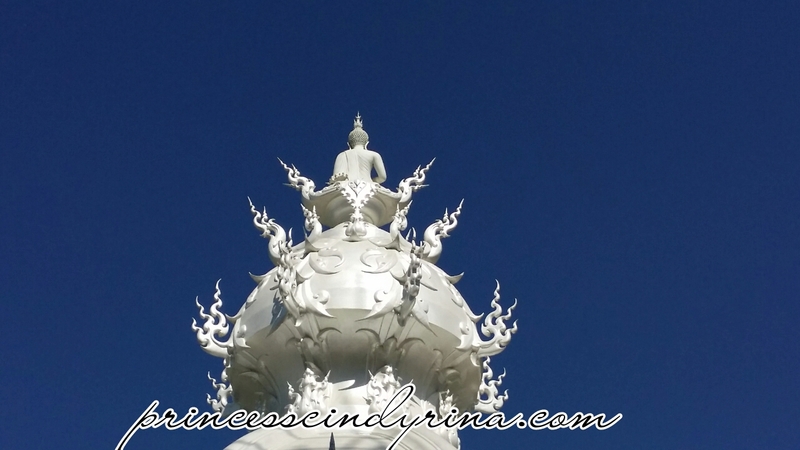 First time saw white colour temple and also creative. 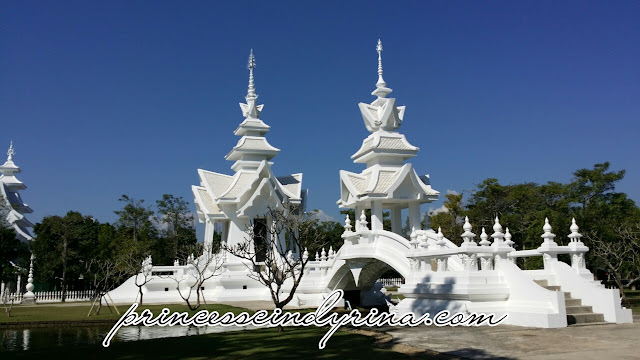 If i have change travel to Chiang Mai , i will visit the temple. 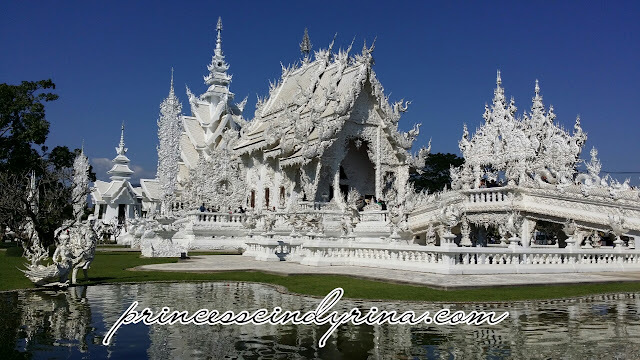 The White Temple is in Chiang Rai really stunning and I love the details. I wish to go Chiang Mai also. eh so unique, different from the norm. a bit morbid, but hey, its a place of worship so i guess all is good. Not been to the White temple but it sure looks interesting with the different statues and all. Will factor this place in when I visit in December for a race. I am definitely visiting this temple if I go to Chiang Mai. One of the reasons is because of it's snow white color. There are many unique temples in Thailand and I really need to see everything! This looks really amazing!!! Will have to check it out the next time I'm there. Are you based in Thailand? Have not been to Chiang Mai. But I wish to go Pai!